Booker announced he was running for president on Feb. 1. Sen. Cory Booker crisscrossed the state of Iowa for first time as a presidential candidate on Saturday -- promising to pull a divided nation back together and eschewing negative campaign rhetoric. At times Booker, a New Jersey Democrat, discouraged crowds who would "boo" at the mention of Republican leaders. With his fresh campaign slogan “Together, America, We Will Rise,” Booker encouraged his followers them to practice compassion and work together with their political opponents to find common ground. “I’m not running to beat Republicans, but unite Americans," he said. As Booker traveled to campaign events that stretched from the rural sections of Iowa to the state’s capital, many residents said they felt that his rhetoric mirrored Obama’s 2008 and 2012 campaign messages of “Hope and Change." “I think when they look at him they will see Barack Obama and they’ll think...‘Oh my God, remember what it was?,” said Rita Robinson, Cedar Rapids resident. I have to beat Republicans, but unite Americans. 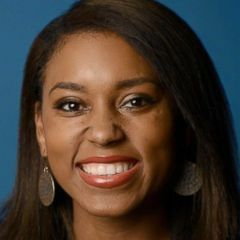 “I don’t think we’re ready for black and female," Robinson told ABC News. "I wish, but I don’t,” she said. 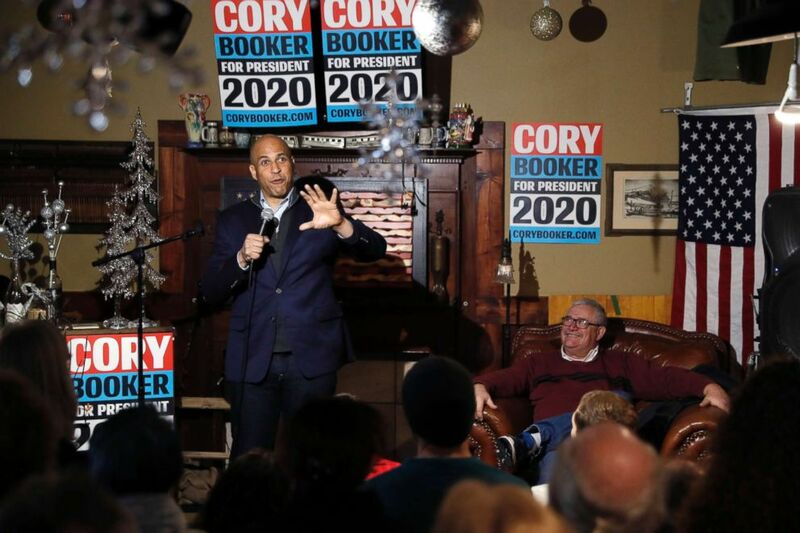 (Charlie Neibergall/AP) Sen. Cory Booker, D-N.J., speaks during a meet and greet with local residents, Feb. 9, 2019, in Marshalltown, Iowa. Regardless of the makeup of the crowds, at some events the turnout exceeded the space available -- as attendees gathered close together to escape the often-single digit temperatures outside. Booker's largest event at the Des Moines Social Club drew 500 people, according to campaign aides. Even in front of a mostly white audience, Booker called for social justice in Iowa and referenced the civil rights movement. Iowa is a key state in presidential elections -- it holds the first caucus in the nation and in turn sets the tone for the rest of the nation. It’s not unusual for residents to bump into a presidential candidate at a local coffee shop or restaurant -- vying to pitch voters on why they deserve to represent the country. I don’t think we’re ready for black and female. I wish, but I don’t. Booker's family ties took center focus in his campaign speech to voters. He mentioning that in Buxton -- a coal mining town where his grandmother lived -- people of all races worked together to fuel America. “I thought he talked too much about himself and [didn't tell] us the plans for the future and [how he would put] those plans into action now,” Allen Max Richards said after attending Booker’s forum in Marshalltown. I don’t want people to think in order to be tough you have to be mean; in order to be strong, you have to be cruel. I want to campaign how I want to govern. “I don’t want people to think in order to be tough you have to be mean; in order to be strong, you have to be cruel," " the senator said during a campaign event in Des Moines. "I want to campaign how I want to govern." Vowing to the never take money from pharmaceutical companies or corporate political action committees, Booker concluded the first campaign stop in Iowa with selfies and hugs as Iowans waited a few hours just to meet the next presidential hopeful who stops by -– Sen. Elizabeth Warren. Within just a few hours of Booker’s first event, the Iowa Republican Party quickly released a statement criticizing him. “Cory Booker will say just about anything to stand out in the Democrats’ crowded field of coastal liberals,” Iowa GOP Chair Jeff Kaufmann said in a statement. “Iowans can see through his theatrics and still reject his policies - like his embrace of trillion dollar government programs, burdensome regulations for Iowa farmers and his plan to eliminate private health insurance," Kauffman said.